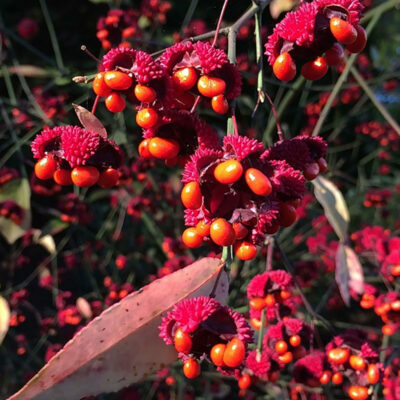 This native deciduous shrub has something of interest in every season. Small white flowers emerge in the spring. Dark green foliage in the summer is held on dark green stems in an open, airy habit. The best is in fall when the seed pods begin to swell and turn from green to a deep purplish-pink, until they burst open to reveal plush orangish-red fruits. TOO FUN! Full-part shade. Average to slightly acidic soils. Height 4-6′. Spread 3-4′. Zones 5-10.